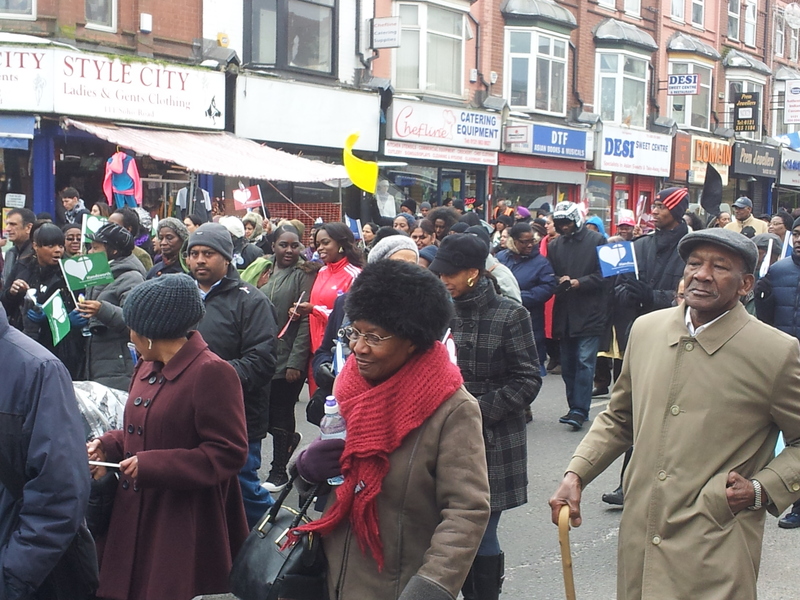 Twelve churches came together to walk the length of the famous Soho Road, to celebrate and share a historic moment. The Good Friday walk saw communities walking side by side and then culminating in an uplifting faith inspired service held near the Soho Road Gurudwara. The event was a national observance and celebration of the Good Friday message across all denominations. Reflecting on the event, Sewa Singh said: “It was a fantastic opportunity to walk with colleagues along the Soho Road to show unity and to encourage others to join in the walk. We have always maintained that there are good working relationships, with the majority of people working together well. It is important that we celebrate each other’s religious and cultural events together. Sikhs are committed to working in partnership with those from all faiths and none to ensure the wellbeing of all. I am pleased today went as well as it did”. 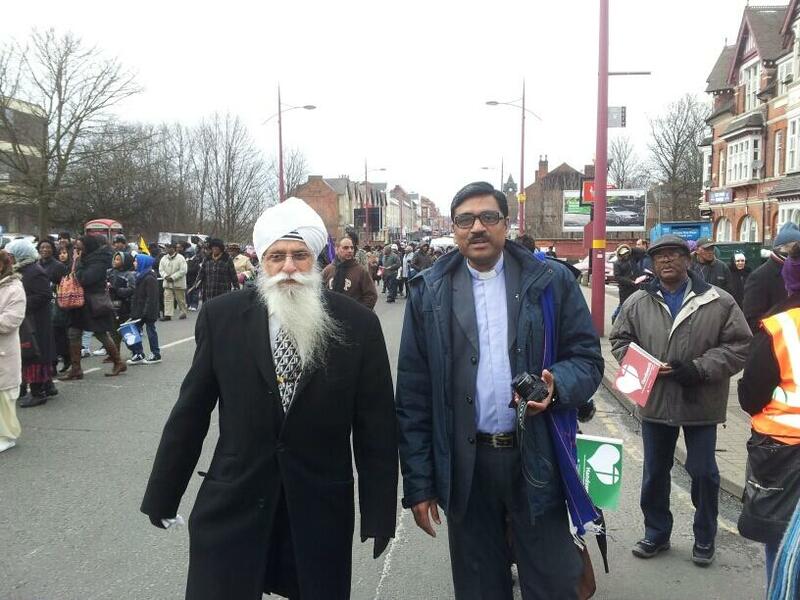 Reverend John Mall from the Baptist Church in Handsworth was ecstatic that colleagues from the Guru Nanak Nishkam Sewak Jatha (GNNSJ) and the Nishkam Civic Association (NCA) had turned out to support the walk. He captured the moment by saying, “It is really great to see our Sikh brothers and sisters here supporting us and making this event even more special for all to enjoy”. Rev John Mall than made a heartwarming announcement on the PA system to publicly thank the Sikh community and to inform all attendees that the Sikh volunteers had put on refreshments and hot tea as a mark of love and respect for all gathered at the event”. The serving of refreshments and tea to all the by-passers and Walk of Witness attendees was only made possible by the dedication of volunteers. The volunteers came from the Gurudwara, Nishkam Centre, neighbouring businesses, including Marg Sat Santokh (a timber merchant and fitted kitchens supplier), Nishkam Pharmacy, the Photo Shop, the Flower Shop and MySafety Hub. Rev John Mall said that the volunteers had added a whole new dimension to the Good Friday event a nd it was the icing on the cake. Mr Mandla went on to say, “The volunteers as always demonstrated that sacrificing time and serving fellow citizens was a priceless undertaking for them. We are happy to be part of today to mark a joyous day with our friends”. Amrick Singh from the Nishkam Centre remarked on the warmth generated at the event despite the very cold weather spell being endured. He commented, “Having spoken to distinguished colleagues today at the event like Ricky Dehaney, Desmond Jaddoo, Rev John Mall and Pall Singh from the Lozells Project the sentiments shared were that the day demonstrated why Handsworth was so special and also exemplified what the resurrection meant. It was about the truth always being victorious and living for ever; it was about sacrificing oneself for others; it was about forgiving and looking forward; and it was about celebrating our differences whilst rejoicing in our uniqueness. All religious traditions and faiths are based on the foundations of compassion, mercy and forgiveness. “Greater collaboration and partnership working across people of all faiths is clearly evident and present in Birmingham, we should all be proud of this”. Chaired by Bhai Sahib (Dr) Mohinder Singh it aims to serve and uplift society through the practice of core values – nishkamta, or the spirit of selflessness, being one of them. Inspired by spirituality, GNNSJ has generated a flourishing culture of volunteering, which has contributed immensely to transform visionary projects into reality.